The arrival of Claudio Ranieri as Fulham coach should ensure an end to the chaotic selections, loose defending and naive approach that marked the promoted team’s turbulent first three months back in the Premier League under his predecessor Slavisa Jokanovic. They were the enduring virtues of his Leicester team that pulled off the most improbable title triumph in English soccer history in 2015-16, so expect Fulham to show similar characteristics under the amiable Italian as he bids to steer his new side to safety. Ranieri has taken over a team that is bottom with five points from 12 games and that has the worst defensive record of any professional side in English soccer — with an average of nearly 2.6 goals conceded per match. Jokanovic sent out Fulham to play in an expansive and open style that allowed them to be picked off with ease. He never fielded the same back four. No wonder Ranieri said his priority was to sort out the defense and finally keep clean sheets, with the reward for the players a trip to fast-food chain McDonald’s for burgers. Famously, pizzas were his gift to Leicester’s squad for shutouts. Compared with masterminding a title success for Leicester over the superpowers of the league, keeping Fulham up should be child’s play for the 67-year-old Ranieri. Fulham, after all, is only three points from safety. It has 26 games left to play. It has a squad containing more than 100 million pounds ($113m) worth of new talent bought in the offseason. In theory, there are at least three rival teams less equipped to stay up. 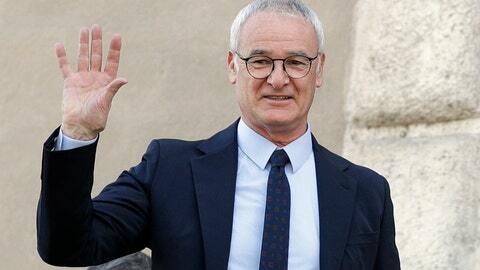 “This Fulham squad has exceptional talent that is contrary to its position in the table,” Ranieri said. He could hardly have a kinder first match either, a home game against a Southampton side that has failed to score in half of its league games and has only one victory. Ranieri needs to settle on a goalkeeper — Jokanovic played three in 12 games — and a fixed back four. He also requires a central midfield combination that provides better protection for his defense and must get more out of 18-year-old Ryan Sessegnon, who was Fulham’s standout in the second-tier Championship when playing on the left wing but has sometimes featured at left back this season. In attack, can Aleksandar Mitrovic and Andre Schuerrle be Fulham’s version of Jamie Vardy and Riyad Mahrez, Leicester’s attacking pair that excelled under Ranieri? The combinations have different profiles — where Vardy had sheer pace, Mitrovic has presence and strength; where Mahrez was all about touch and technique, Schuerrle has a lethal shot and an eye for goal — but their importance is similar. Can the coach once nicknamed “The Tinkerman” when in charge of Chelsea provide some stability at Fulham? Ranieri must also instill a new mindset.